This is a very small multi-tool that can be stored in a docking station featuring a small flashlight. It includes a set of pliers, wire cutter, wire stripper, sheet shear, standard philips and flat screwdrivers, micro philips and flat screwdrivers, 1/4'' rule markings and key ring. It weights only 2.2 oz in total and is only 2-3/8” x 1-1/4” x 1/2" when folded. The tool is stored turning the legs and can then be coupled to the micro-light docking station, releasing the tool from the station is easy and you just unturn the legs to use it. The mpro is nice for small repairs and other precision jobs that can benefit from a small multi-tool, as you can imagine it can't be used for jobs that require force. The micro light uses a LED bulb and two coin sized lithium batteries and is good to illuminate keyholes or as a small light to work with the mpro tool in case of need. Each of the tools included does the job well, you are basically using a good set of micro pliers with some screwdrivers so the tools complement well. Being as small as it is the mpro is probably one of the few available options as a keychain sized set of pliers, smaller than the smallest leatherman tools. You can read more and order from SwissTech's website. The "bullet" is proably the most well known model of the Fisher space pen family. This small pen is just 3.75'' closed and 5.25'' open, and comes with a Fisher PR4 refill. As widely known the fisher refills are pressurized meaning the pen will be able to write upside down, under water, in greasy paper and many other adverse conditions like for example without gravity. The pressure makes the ink flow regardless of the writing surface or the conditions. The bullet can be ordered optionally with a pocket clip, you may want to secure the pocket clip with some drops of super glue because it has a tendency to fall and that can be a problem. The shape of the pen is very confortable for writing. If you are used to long heavy pens this may not be your best choice. The bullet can be get from $10 to $30 or more depending on several options for the finish and materials, there are silver models, brass models, matte models, laquered in different colors, titanium coated models and many special editions. You can check options in the Fisher official website or order some different models from Penwa. This is a folding knife offering some extra functions. This knife has two ways of deploying the blade. The first, is Leatherman's patent-pending Blade Launcher™ that works as a flipper in other knives. The second method, is a thumb stud. The blade is a drop point made of 154CM steel and can be very sharp, once opened the knife locks in place via a liner-lock mechanism. In addition there is a bit driver. One can carry three double-ended bits onboard the knife at any given time, with one in the bit driver and two in the Bit Holder, which is integrated into one of the glass-reinforced nylon handles. The other unique feature of this knife is the combination Carabiner/Bottle Opener. Both of these unique features remain hidden in the knife until needed. A set of 10 bits is supplied with the knife, 3 of them in the knife and seven more in a plastic bit holder. There is also a pocket clip in the side where the extra bits are not stored. The E306x is a nice folding knife with the addition of a carabiner to clip it to many places if needed, a bottle opener and a very good screwdriver with replaceable bits. Depending on the activities you do often the aditional tools may become useful and the knife will be a pleasant tool to use. If you don't use the screwdriver or you carry a multi-tool with you maybe a better knife that is only a knife is your preferred option. 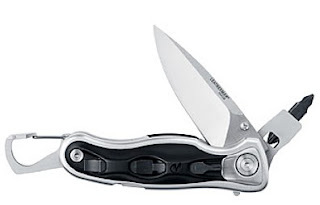 You can order for $55 from REI or read more from Leatherman's website. The Fatboy is a pack to use for your everyday needs. It is bigger than a waistpack and smaller than most backpacks. It can be used either as a waistpack (not recommended) removing the shoulder strap or in badolier style with the padded shoulder pad. 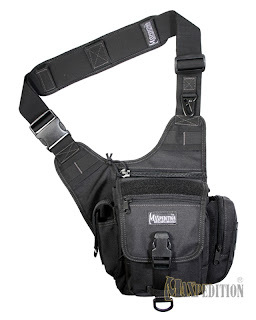 The main compartment is accessed opening an adjustable buckle that also has a d-ring. Once the flap is opened you have access to the main compartment and to two smaller compartments in front of the big one, one of them closed with a zipper. The unzippered compartment is good for things that you want to access quickly while being protected or hidden under the main flap, the zippered compartment with a pocket inside is great for small loose items. The main compartment is protected by a protective hoodie that can be depolyed in case of severe rain or just left opened otherwise, there are mesh pockets on both sides of the main compartment. Inside the main compartment you can fit things as big as some reflex cameras with their accesories this should give you a good idea of the size. Behind the main compartment there is a strap that can be used to attach the Fatboy to your belt for extra security or as an additional support point if the pack is heavy. There is padding to make the pack confortable against your waist. With the main flap closed you have access to a zippered pocket in the flap useful for small flat items and a big zippered compartment that is behind the main one, here you can put big flat objects maybe envelopes, a wallet, paper, etc. On the sides of the main compartment there are two pouches. One of the pouches is a zippered pouch with straps for external attachment, inside this pouch you can fit multi-tools, flashlights and many other items. The other pouch is a velcro closure pouch that seems to be specially created for flashlights, most of them will fit here. On the sides of this pouch there are pen slots for pens with pocket clips. The ends where the shoulder straps are attached have some surprises too, one of them has another pouch the smaller of the three with a buckle closure that is good for cell-phones or items you need to keep very accesible. An MP3 player, is a good idea since it is easy to reach your head with the headphones from the shoulder band pouch. On the other side there is a carabiner in the same style of the maxpedition keyper that can be used to hang a keychain or other objects, below the clip you have more straps for attachment of extra pouches. Constructed in excellent nylon with double stitching and lot of reinforcement points the Fatboy is an excellent day pack with many pockets, pouches and the verstaility to be expanded if needed. It is certainly a very recommendable pack for your daily stuff. The Fatboy is available in black, tan, olive and camo versions. You can read more at Maxpedition's website and You can order from Lighthound for $59. 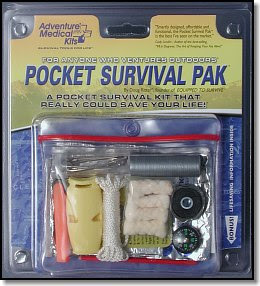 This is a pocket survival pack designed by Doug Ritter from Equipped to Survive and distributed by Adventure Medical Kits. The kit includes a spark-lite fire starter and 4 spark-lite tinder-quick as a quick all-weather fire starting device. As an alternate fire-starting device you have a fresnel lens magnifier. For signaling you have a Fox40 micro whistle in yellow and a good quality signal mirror. For repairs you have duct tape in 22'' x 2'', 6 feet of stainless steel utility wire, 10 feet of braided nylon cord, 50 feet of black nylon thread, a heavy duty sewing needle and 4 safety pins. There is a 3sq feet piece of aluminium foil useful to get water or for cooking, a small compass, pencil and waterproof paper, a small scalpel blade, and a fishing kit. Everything inside a water resistant vynil pouch. The elements included in the kit are high quality and there will be many coincidences in a kit that a survival expert would build for himself in case of need. Nothing in the kit has an expiration date and everything is water proof. While the elements are excellent the kit is a general purpose kit and might be a little incomplete for either a urban or outdoors mini kit. It is certainly a great way to start a personal kit adding the elements you need for your specific scenarios. As any personal kit it is designed to be carried with you probably in a cargo pocket, so if you lose your backpack, your bags or averything you still have the kit with you. That explains the small size. You can read more about this kit in ETS webpage. You can choose from a list of retailers to order it one of them being EDC depot for $25. 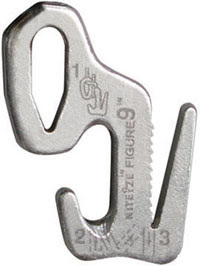 This new product from nite-ize is a rope-tightener and tension tool. It can be used whenever you need to keep rope tigh as for example to close a car trunk, carry something above the car roof, tie boxes together for transportation, camping, boating and other scenarios. It is also suitable for improvised lanyards. The tool is made of aluminium offering different ways to thread the rope with a dented opening to keep the rope tight. The instructions to thread the rope around the figure 9 are engraved in the tool itself so you don't have to remember anything to use it just loop the cord around the figure 9 and keep it tight. The tool works up to 50lbs of tension so it is not suitable for rescuing or climbing applications just a tool for general use involving ropes. It works great with paracord and can also be used with utility rope. You can get it in two sizes, small or big in different presentations with some included rope or not. A single figure 9 retails for $2.50 the small one and $4.50 for the big one. A pack of four small ones with rope costs $9.50 and a pack of 2 large ones with rope $7.50. You can read more in the product webpage or order from Flashlightlens.com.